The 'B' Aromatherapy Starter Kit includes twelve more of our favorite Essential Oils. 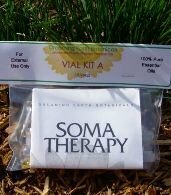 The Group B Essential Oil Kit includes: Cedarwood-Atlas Essential Oil, Roman Chamomile Essential Oil, Clary Sage Essential Oil, Cypress Essential Oil, Frankincense Essential Oil, Grapefruit Essential Oil, HoWood Essential Oil, Juniper Berry Essential Oil, Marjoram Essential Oil, Myrrh, Petitgrain, and Australian Sandalwood. This group is priced a bit higher than Group A because many of the essential oils included are more costly. Each essential oil comes in a clear glass vial, 1/6 dram (.7 ml) - approximately 25 drops per vial. If you need small pipettes, you can purchase them under Aromatherapy Accessories. Note: Normally ALL Essential Oils should ONLY come in dark glass containers (ours are in cobalt blue or amber glass) - our vials are a deliberate exception to the rule. They are in clear glass so that you can see color and clarity of the oils. Vials are not meant for long-term storage and should be stored out of direct sunlight and used within a few months.